How is everyone feeling after last week? Good because you behaved yourself and ate well? Or bad because you ate way too many cookies, along with anything else you could get your hands on? I’m in the second category and while I loved every little morsel that touched my lips, the guilt has set in and I’m not waiting for the calendar to hit January to get things back to normal. I got home from visiting my sister on Saturday and yesterday I decided no more cookies, no more chocolate, and no more throwing restraint out the window. I woke up and the first thing I did was go over to the produce stand and load up on fruits and veggies. I have found that when I commit to eating some kind of fruit or veggie with every meal or snack, I always do better. So now I have a loaded fridge and I’m feeling good going into this week. I’m starting it off right today with this Tartine with Eggs & Asparagus. Asparagus, which is cooked until perfectly crisp and bright green, is partially chopped and added to eggs mixed with milk and Parmesan cheese. Thin slices of bread (I used leftover sourdough) is broiled until golden and toasted and then rubbed with garlic. Once the egg/asparagus mixture is scrambled to your ideal consistency, it is piled on top of the toast and garnished with the remaining asparagus tips. 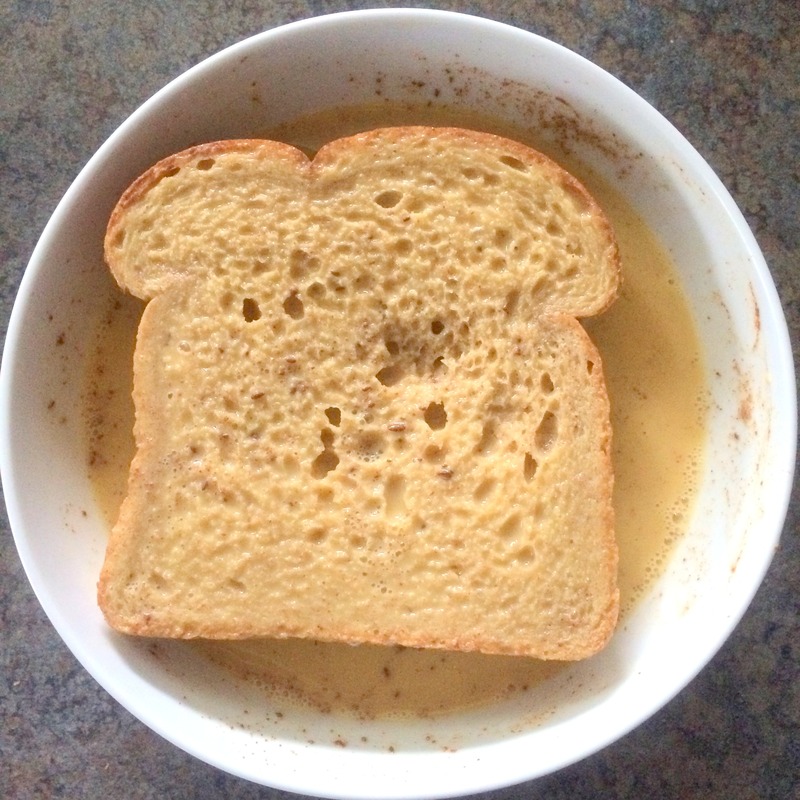 To keep the calories down, I used skim milk instead of whole milk and not as much Parmesan cheese. The best part of this open-faced breakfast sandwich in my opinion? The garlic! Just a little rubbed onto the toasted bread provides such a pleasant flavor to the eggs that I devoured this dish in an embarrassingly short period of time. Getting some veggies in with my breakfast feels like a step in the right direction – especially after eating cookies for breakfast last week. In a skillet, bring 2 inches of water to a boil. Salt the water, add the asparagus and simmer until crisp-tender, about 3 minutes. Using a slotted spoon, transfer the asparagus to a large bowl of ice water; let cool and drain. Cut the top 4 inches from the asparagus spears and set aside. Thinly slice the bottom halves of the asparagus spears. Preheat the broiler or a grill pan over high. Cook the bread until toasted and charred in spots. Rub the toasts with the cut sides of the garlic clove. Drizzle with the EVOO and sprinkle with flaky salt. In a medium bowl, whisk the eggs, milk, thinly sliced asparagus and cheese. Season with pepper. In a large skillet, melt the butter over medium. 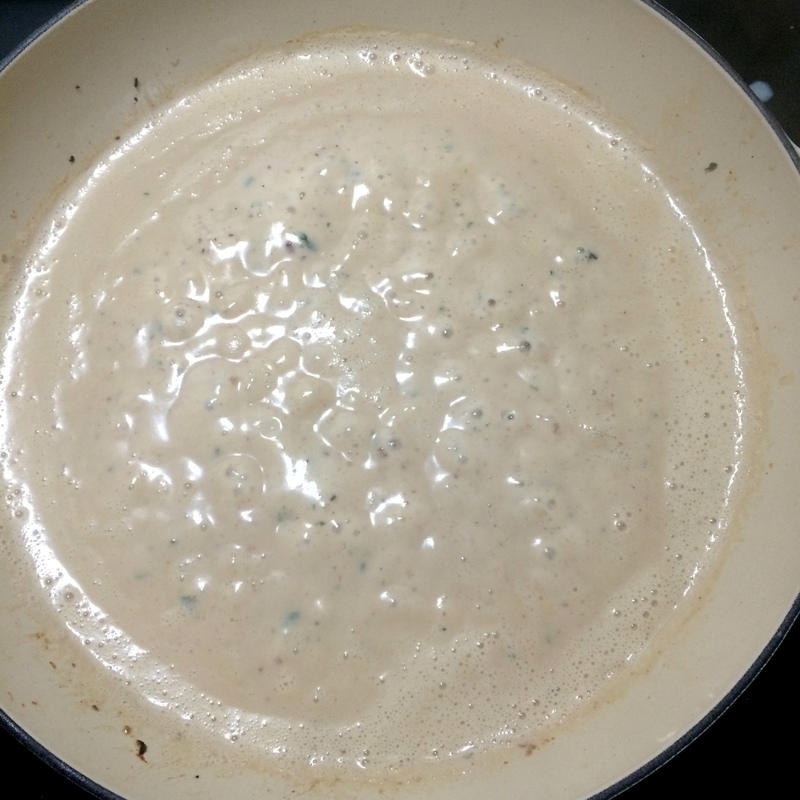 Add the egg mixture and cook, stirring occasionally, until the eggs begin to firm up. Mound the eggs on the toasts and arrange the asparagus tips on top. I’m so happy to be home. I was in Chicago two weeks ago for vacation, which was much needed, and in Atlanta last week for work. There is just something so nice about coming home to your own space, your own stuff, and your own bed. I went to bed so early last night that it’s embarrassing, especially since it was a Friday night. I woke up this morning feeling good (despite the fact I’m battling a head cold) and couldn’t wait to get back in my kitchen after two weeks away. Most people don’t think to spend their Saturday mornings cooking but it’s one of my favorite things to do. 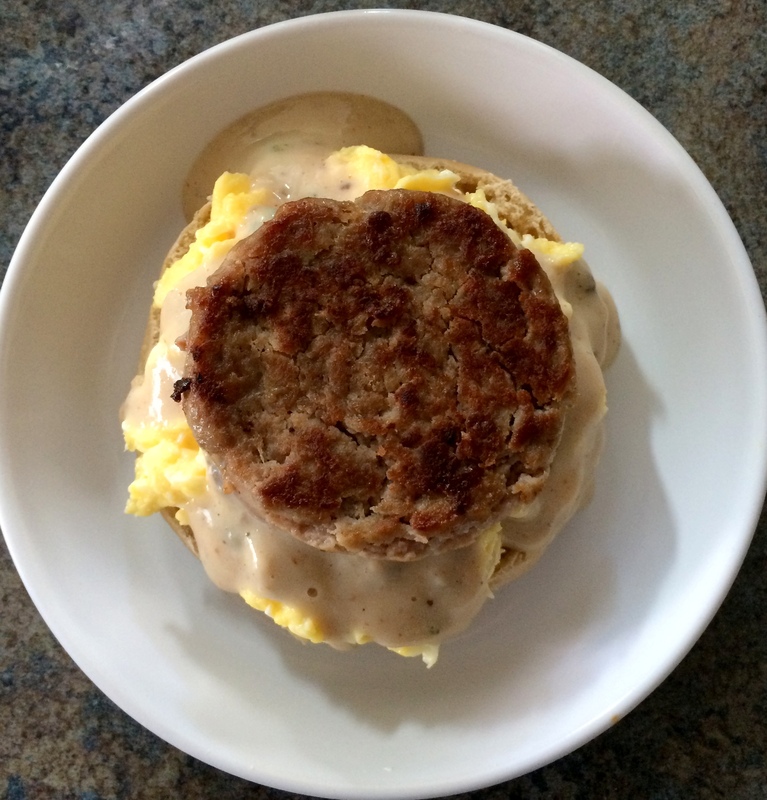 This morning I was so excited to make myself something new with these Sausage, Gravy, and Egg Breakfast Sandwiches. 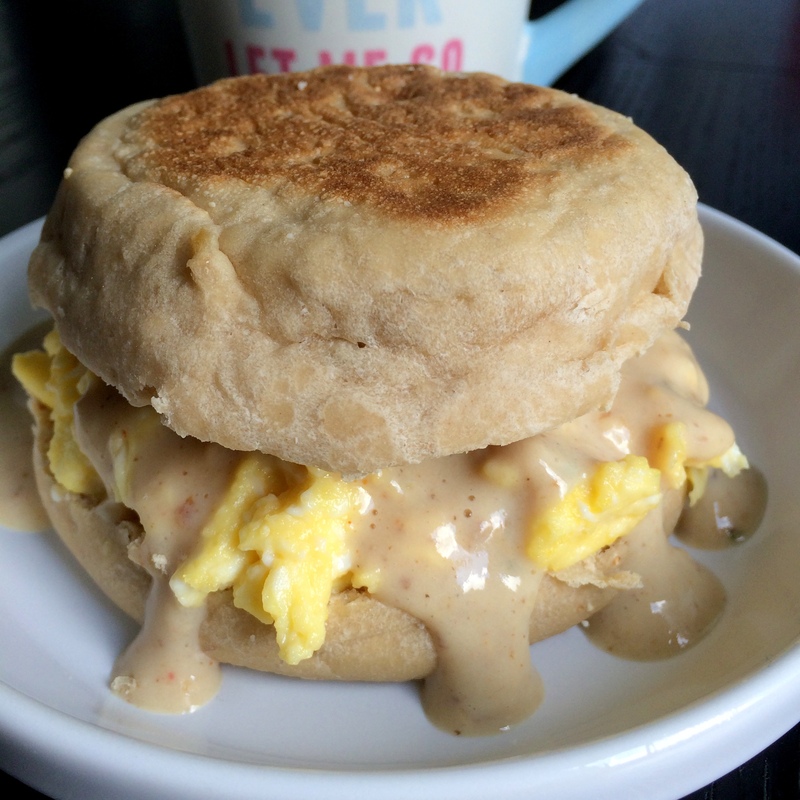 English muffins are filled with turkey sausage, scrambled eggs, and a light gravy flavored with fresh thyme, garlic and onion powders, and cayenne pepper. This isn’t your ordinary breakfast sandwich. You aren’t going to find this at your local coffee drive-thru. 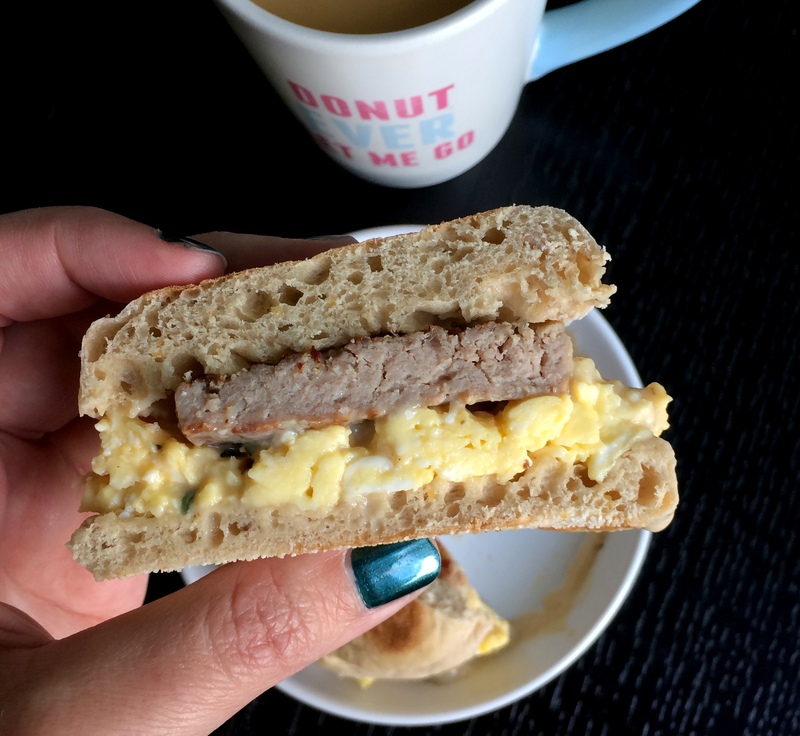 I’m a bit of a sucker for turkey sausage breakfast sandwiches (Wawa Sizzlis are my FAVORITE!) so this was a nice healthier alternative. The best part in my opinion? The thyme in the gravy. The gravy makes this a bit of a messy sandwich but if you are eating them at home, who cares? Lick that gravy off your fingers because no one is watching. I’m heading to a tailgate tomorrow morning so I might just wrap one of these up and take it with me. No one at the tailgate will care if I lick my fingers either. 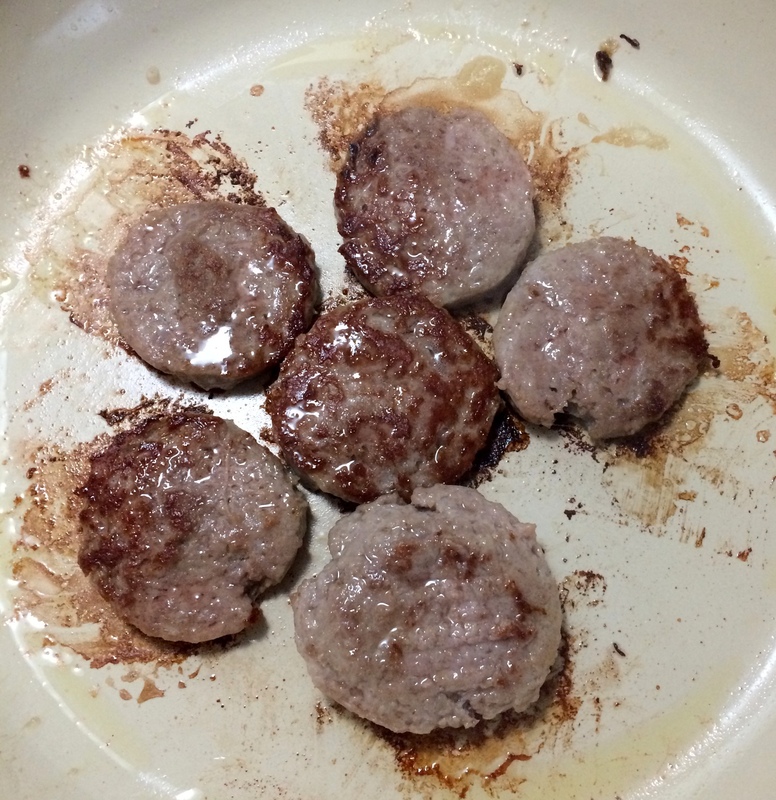 Divide sausage into 6 equal portions; pat each portion into a 3-inch patty (about 1/4 inch thick). Heat a large skillet over medium-high heat. Add 1 teaspoon oil to pan; swirl to coat. Add patties; cook 2 minutes on each side or until done. Transfer patties to a plate. Reserve drippings in pan. 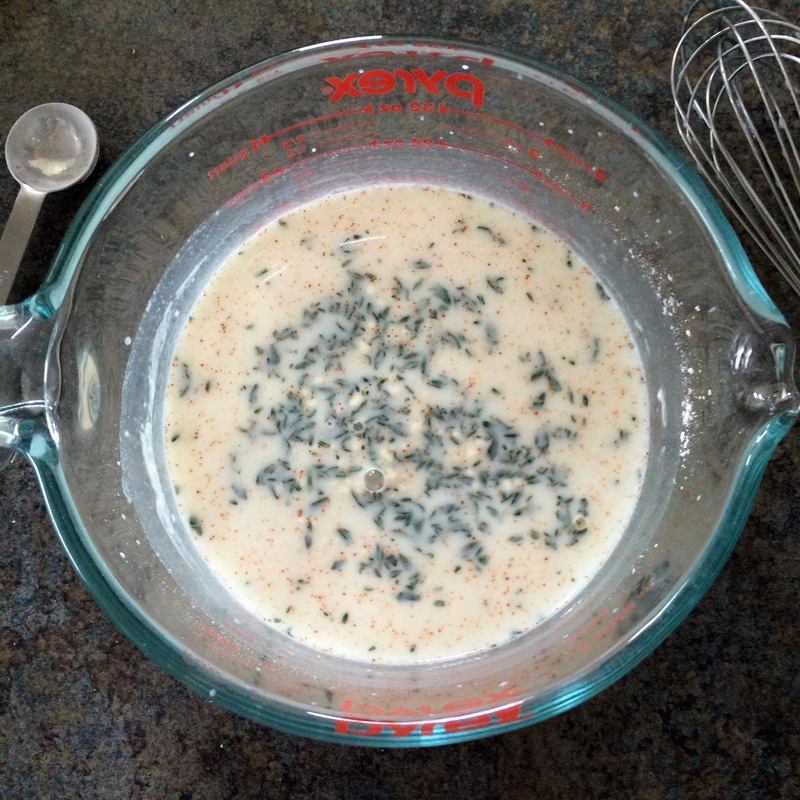 Combine milk, flour, thyme, onion powder, garlic powder, salt and cayenne pepper, stirring with a whisk until smooth. Add mixture to pan; bring to a boil, scraping pan to loosen browned bits. Cook 3 minutes or until thick and bubbly. Remove from heat. Heat a large nonstick skillet over medium heat. Add remaining 1 teaspoon oil to pan; swirl to coat. 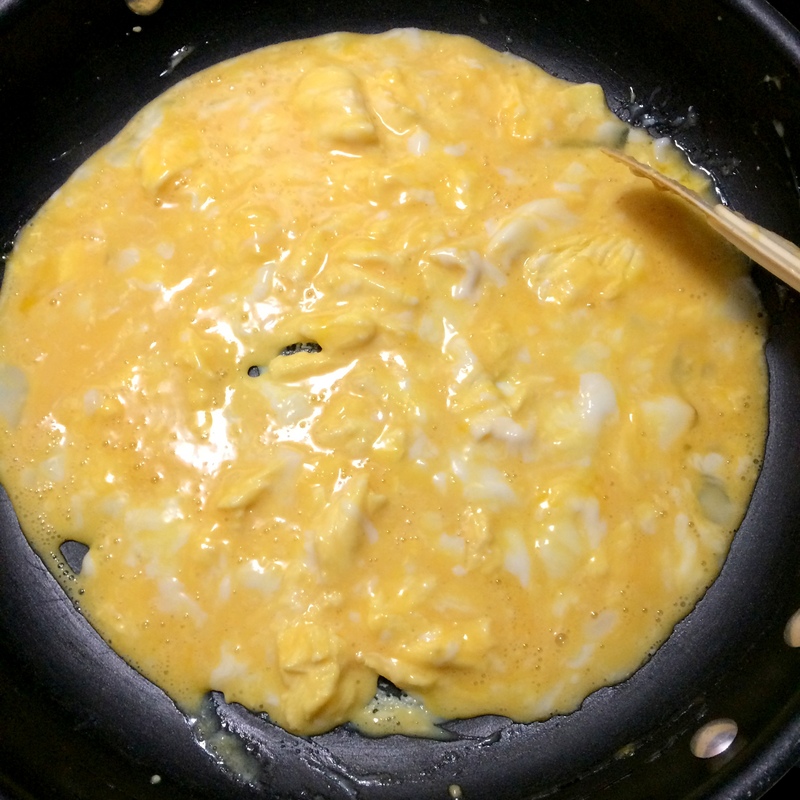 Add eggs; cook 4 minutes, stirring until curds form. Divide eggs evenly over bottom halves of muffins. Top each with 3 tablespoons gravy. Place 1 sausage patty and top half of muffin on each sandwich. I was in Vegas two weeks ago and one morning my friends and I went to breakfast. (This doesn’t always happen). It was our first morning there and we hadn’t yet been sucked in to all the Vegas has. Not that I’m going to tell you anything that happened there – but I will tell you that I came thisclose to ordering French toast that morning. French toast is one of those things that I ate quite often when I was a kid but rarely do anymore. I always consider it when going out for breakfast but never order it. Thankfully, it’s easy to make at home. Got eggs and bread? You can make French toast. 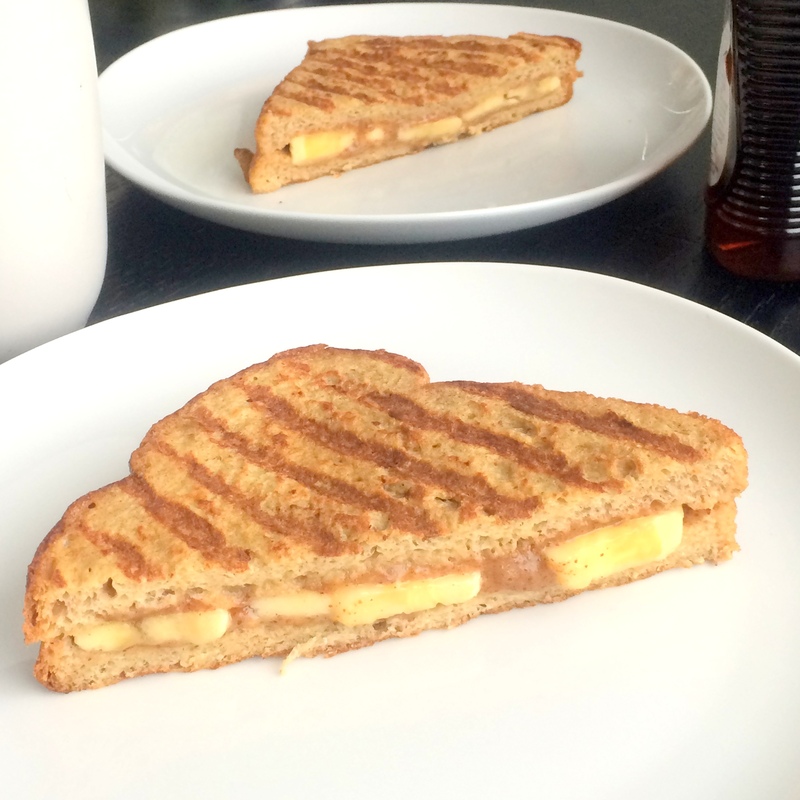 These Banana-Almond Butter French Toast Sandwiches are different twist that are a fun alternative to your standard breakfast. Maybe even your Easter breakfast. 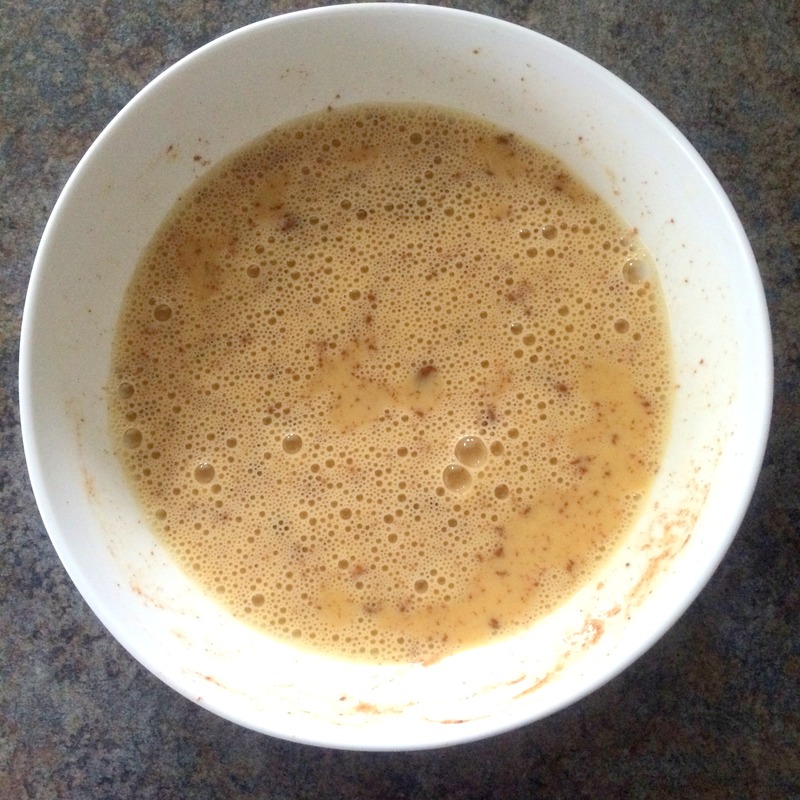 Almond butter, maple syrup, and banana slices are spread between two pieces of break and then dunked in a mixture of eggs, almond milk (or regular milk), cinnamon and vanilla. Grilled until golden brown and slightly crispy, these sandwiches are packed with perfect salty-sweetness. 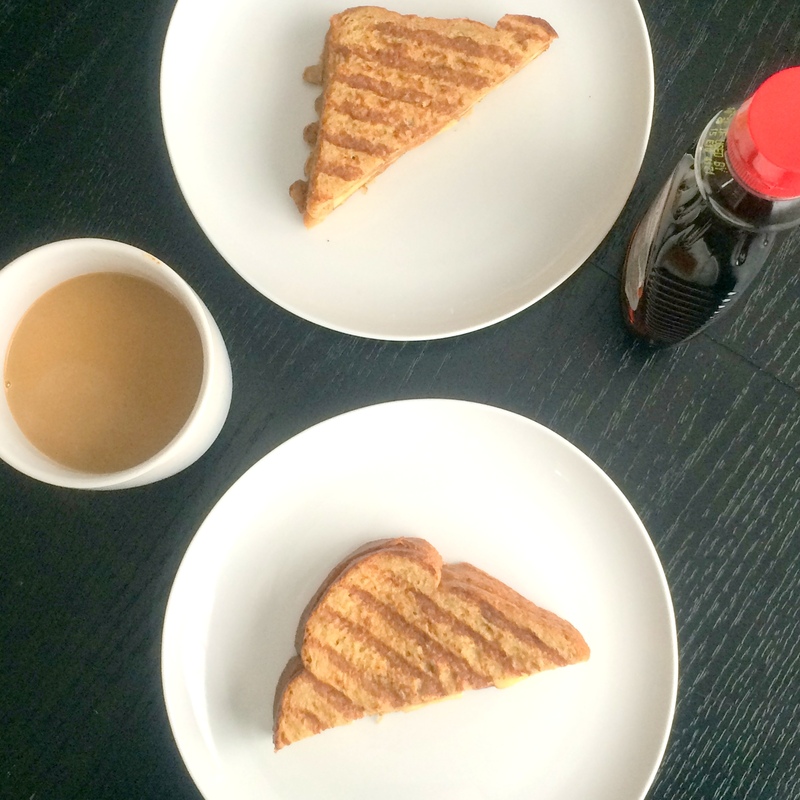 Think of a peanut butter and banana sandwich marrying French toast. So yummy. Surprise your kids with these on Easter Sunday. They’ll be happy they are portable while they are off searching for eggs. Crack eggs into a shallow bowl. Add almond milk, vanilla extract, and cinnamon; stir with a whisk to combine. Combine almond butter and maple syrup in a small bowl. Cut banana lengthwise into 4 thin slices; cut crosswise into halves. Spread almond butter mixture evenly across bread slices. Top 2 bread slices with 4 banana pieces. 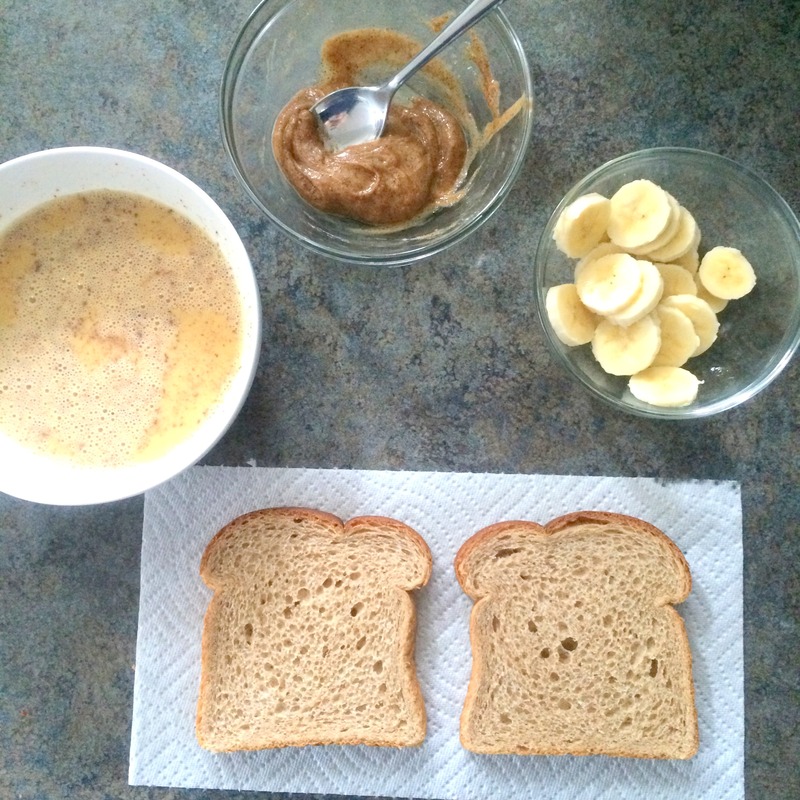 Place remaining 2 bread slices over banana, sandwiching almond butter and bananas inside. Heat a panini press to 425°F or grill pan at high heat. Dip sandwiches in egg mixture, and let excess drip off. 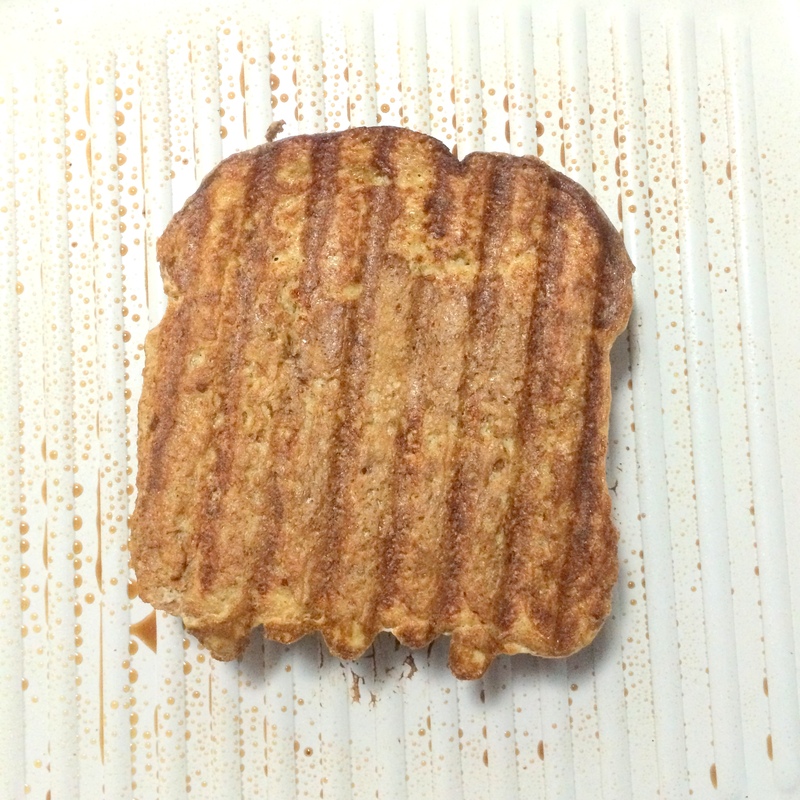 Lightly coat grill plates of panini press or grill pan with cooking spray, if needed. Arrange sandwiches on press or grill. Push down gently to flatten. Cook 3 to 4 minutes or until sandwiches are browned on the outside and hot in the center.Place sandwiches on a cutting board. Cut in half diagonally. Serve hot.